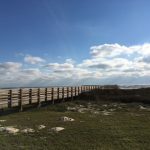 When we plan our long camping adventures, like our three-week Wild West adventure, 2016 Pennsylvania trip, or recent Texas tour, developing an easy and simple meal plan is essential. Such trips will have many days of long travel and many more days of fun exploring. I don’t want to stress over time-intensive meals after long days in the car, and I certainly don’t want to be stuck in the tiny camper kitchen when there are so many exciting things to see. 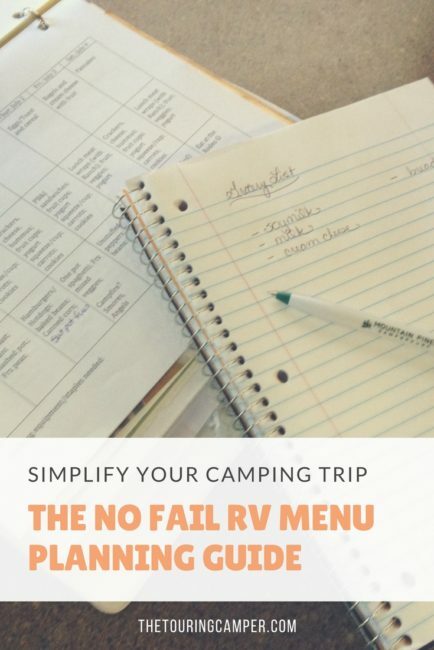 Thus my motto for planning trip menus has always been “keep it simple.” In this “no fail RV menu planning guide” I will teach you the ways I stay organized and how you can develop a menu plan that will keep everyone a happy camper. I add all the ingredients–both those I already have on hand in my home pantry as well as the ones I need to purchase at the store–to my packing checklist. This step helps ensure I don’t leave any ingredients behind. We prefer to have a mix of meals–some that we prepare over a campfire and others that we can cook in a slow cooker, on the grill, or on the stove–so that we can juggle meals based on the weather. 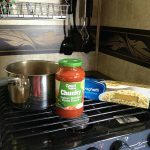 We generally aim to eat our outside campfire meals early in the trip if the weather is good so that if we have any bad weather days later on, we still have meals that we can prepare inside or under the awning. Of course, we’ve had some trips where the weather has been miserable the whole time, but having some flexibility in your menu will make things go smoother. Rotate your menu: By eating the same things every week or every 10 days, you will cut down on the number of different spices and staples you have to keep in your camper cupboards. This method also helps use up any remnants in your pantry, like that little bit of pasta still left in the box or that hunk of cheese you had leftover. Pick recipes that have corresponding ingredients: The more recipes that use the same things, the fewer items you have to keep in your camper. Stick to simple recipes: I have some go-to recipes at home that aren’t hard to make, but many of them have a lot of cut-up preparation or a long list of ingredients, particularly spices. Other recipes require you to boil a pot of pasta or rice while you are cooking the rest of the meal in another skillet–and given how small the camper stovetop is, this can sometimes get complicated. 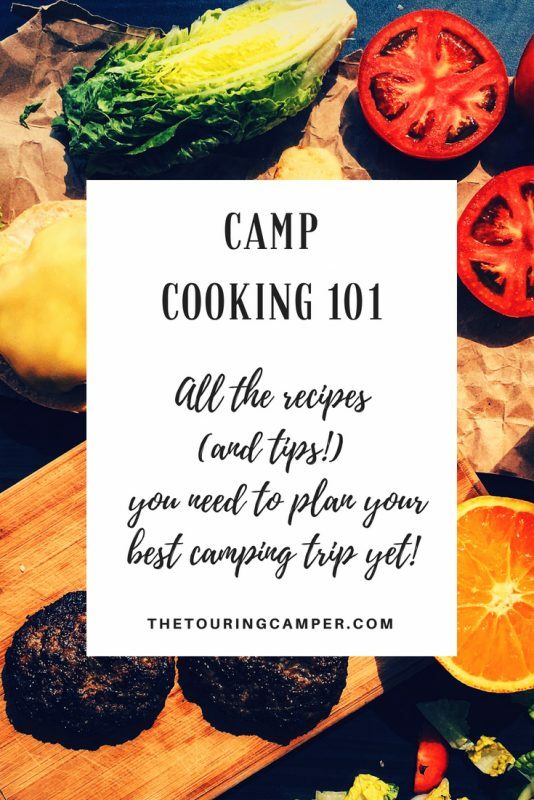 So for camping trips I prefer recipes that call for fewer ingredients and fewer steps, as well as ingredients like frozen or canned pre-cut veggies that require no preparation. One pot pasta meals are great for easy camper meals. Prep ahead of time: Before we leave on the trip, I will often cut up raw meat (like chicken) into the pieces or cuts that I need for recipes. On our West trip, we had two nights that we ate hamburgers. Rather than having to bring all the spices and bread crumbs, we prepped the hamburger meat and shaped all the patties then froze them between wax paper in freezer bags. We also did this with chicken by combining trimmed chicken breasts with our favorite marinade in freezer bags and then freezing them flat to save room in the small camper freezer. Buy smaller packages: Although it is not the most cost-effective way to buy food, sometimes saving space in a camper is more important. So I picked up small bottles of ingredients like olive oil and balsamic vinegar–it was enough to cover all of our recipes, but so much easier to keep in the pantry cupboard. 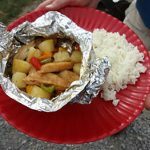 On days you are going to be exploring or touring, plan to have meals that can be quickly prepared when you get back to your campsite, or even better, choose meals that can be cooking in a slow cooker all day. (I have a few of our favorite recipes over here.) We have a crock pot that has a timer function that switches from “cook” to “warm” after the programmed cooking time has finished. So even if we are gone for longer than seven hours, I don’t have to worry that my roast is going to burn. I also heeded the advice of a friend who recommended getting the slow cooker liners–clean up is now so much easier! 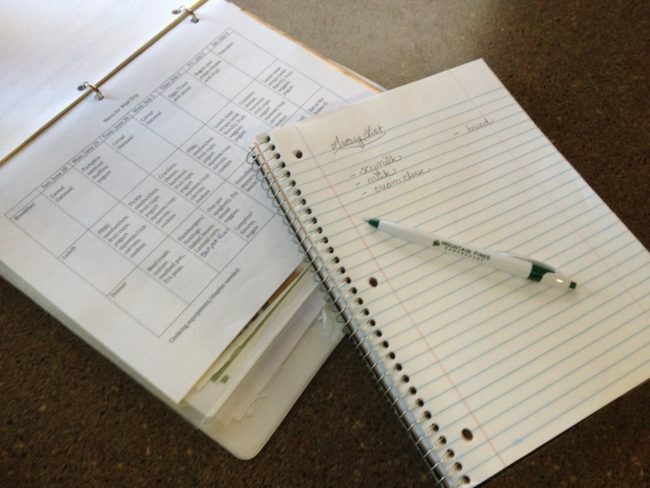 This one’s important: Bring your menu plans with you on the trip! 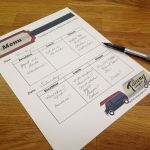 This will help you keep track of what days you are doing what meals and whether you need to do any advance prep, like thaw ingredients, marinate meat, or assemble ingredients in a crock pot. Hi Monica–thanks so much for stopping by! 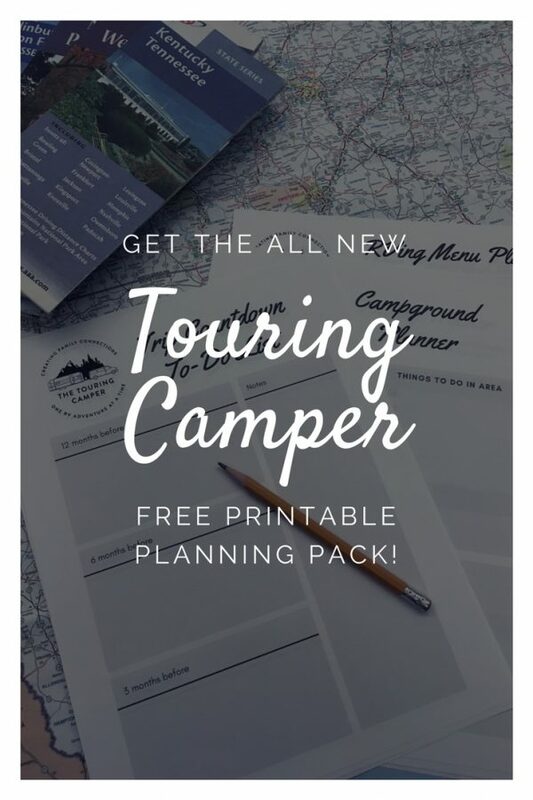 So glad you found some ideas for your camping adventures. 🙂 Have a great summer! Super cool to find you ! 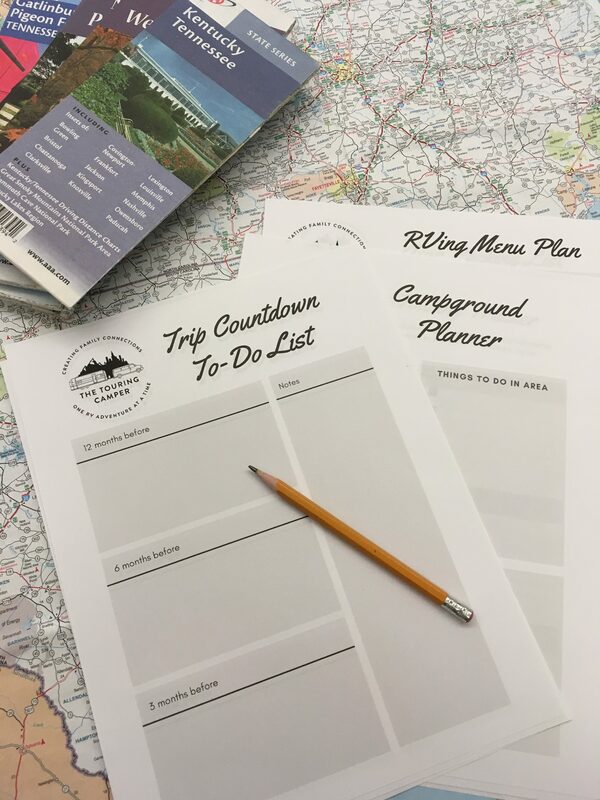 We are flying to our destination and renting an RV, so some of the prep ideas I can’t do, but I like the simple ideas you do have !! Hi Kori–thanks for stopping by and reading! So glad you found some helpful tips! Where are you flying into? Sounds like a fun adventure! 🙂 Happy camping! Flying to CT. Should be interesting how it turns out!